The FactSet Events and Transcripts DataFeed covers earnings calls for companies around the world, with coverage beginning in 2000 for events and 2003 for transcripts. Company earnings calls have long been a key source of information for investors. Since the early 2000s, FactSet has been an industry leader in collecting and transcribing company events across the globe. Beginning in May of 2017, this best-of-breed content was made available via a data feed tailored to power sentiment and natural language processing models with a new solution: FactSet Documents Distributor for Events and Transcripts. The product information and content statistics contained in this document are as of March 2018. The FactSet Events and Transcripts DataFeed covers earnings calls for companies around the world, with coverage beginning in 2000 for events and 2003 for transcripts. Coverage for securities is determined by market capitalization, exchange listings, index membership, and most importantly, client demand. FactSet covers an average of 21,000 companies a year while offering transcripts for approximately 5,400 of them. To better understand the data, it is important to analyze coverage based on the event type, geographical regions, and company sector association. Figure 1 and 2 highlight the steady growth in the number of companies covered for both events and transcripts spanning all sectors. FactSet covers six distinct event types: earnings calls, presentations, special situations, sales calls, analyst/investor meetings, and guidance calls. The most prominent event type (earnings calls) has a growth rate very much in line with company and event coverage (Figure 3a). Figure 3b highlights coverage for the remaining event types. It is important to note that coverage for these event types is determined at the company level. For example, if a firm covered for events and transcripts hosts a guidance call, FactSet would capture and transcribe said event. Transcript coverage is truly global and covers companies in all regions. Figure 4a and 4b show the growth in company coverage and highlights the steady growth of regions outside of North America. It is no surprise that the United States, Canada, and the United Kingdom are the leading countries when it comes to the total number of transcripts. However, Figure 4c shows the strong growth in other areas of the world in recent years. In 2017, for example, more events were transcribed for companies domiciled in India than Germany, France, and Australia. FactSet’s Document Distributor offers transcripts and associated event metadata in a manner that is ideal for systematic analysis through three mechanisms: Document Archives, Events Standard DataFeed and their Document Retrieval API. The Document Archives can be accessed via the FactSet Loader and provides instant access to the full history of transcripts in the form of XML Documents. Accompanying the archives is the Document Retrieval API, which provides users with intraday access to the XML transcripts as they are produced. An important feature of the archive is the inclusion of both the raw and correct versions for each transcript. The raw version is the first to market and the corrected version is a secondary release that has been manually reviewed by FactSet’s team of analysts. By providing access to both versions, users can curtail models based on timeliness and/or accuracy. Additionally, FactSet brings structure to unstructured content by standardizing and flagging key sections in each transcript. Transcript participants are mapped to FactSet Symbology, allowing users to perform historical analysis on firms, individuals, analysts, or brokers using FactSet’s permanent identifiers. FactSet Symbology connects transcripts with other FactSet datasets, instantly enabling deeper, more thorough analysis. Figure 5 highlights how each participant is associated with their employer (affiliation), their employer’s permanent identifier (affiliation entity), and their permanent person identifier (entity). The XML structure presented in Figure 6 showcases the tagging associated with each element of the call: management discussion, question and answer, the speaker, and the type of interaction (type q is for question and a is answer). The last component of the product is access to FactSet’s Events Standard DataFeed, which contains historical and forward-looking metadata associated to company events ranging from event type, date, time, and participant information. The CE_PARTICIPANTS table aggregates event participants for all calls from May 2012 to present day (May 2012 is when FactSet began tagging transcript with FactSet People Identifiers). Without even having to enter an XML transcript, users can explore the linkages of events, companies and participants. For example, Figure 7 shows how you can leverage this table by depicting the most active analyst participants by industry in 2017 (for each analyst, the FactSet Person Identifier is included alongside their name). A common approach with unstructured content is to calculate a sentiment value. 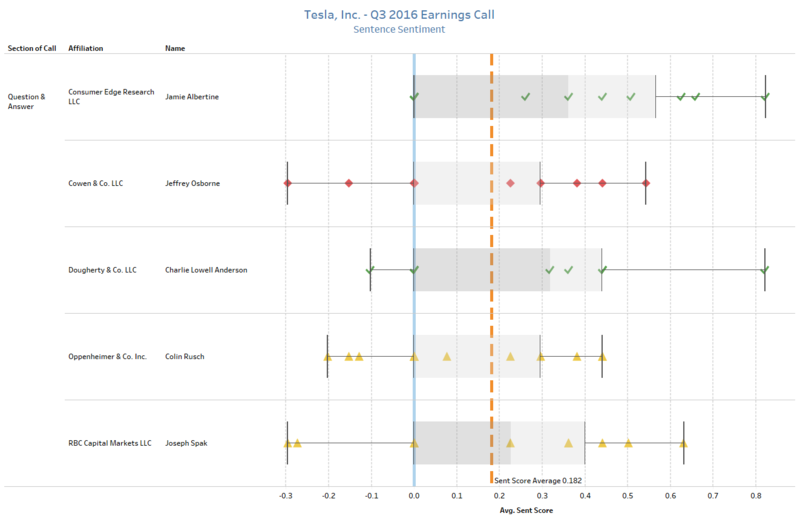 A simple but relevant example of this application can be achieved by analyzing Tesla’s third quarter earnings call from 2016, using a combination of FactSet’s XML Transcripts and an out of the box natural language processing packages (NLP) in Python. By using machine-readable files alongside Python’s Natural Language Toolkit package, the call can be diagrammed to identify how the sentiment of Elon Musk’s comments changed between the Management Discussion Section (the prepared remarks) and the Question and Answer (off-the-cuff). Figure 6 shows the sentiment of the call, which has been quantified by leveraging a popular NLP algorithm known as the VADER model. The average sentiment of the call was positive, with a score of approximately 0.2 (orange dashed line), but the range of values varied quite dramatically from the Management Discussion to the Q&A, where the tone of the call took a turn for the worse upon mention of recent fatalities involving Tesla’s Autopilot. A simple script like this addresses a critical challenge facing fundamental investors. In this scenario, an analyst would be able to receive an output from this call and immediately understand the average tone, notable headwinds, and if other analysts are overly bullish, bearish, or neutral. That type of intelligence allows analysts to create a benchmark that can be cross-referenced across their coverage list, in turn allowing them to allocate their time accordingly. In other words, if Tesla’s overall tone was positive, it may signal that more time could be directed to other ideas or calls where the outcome was more varied. Shifting to the Question and Answer section, the same sentiment analysis can be performed on the questions asked by analysts. 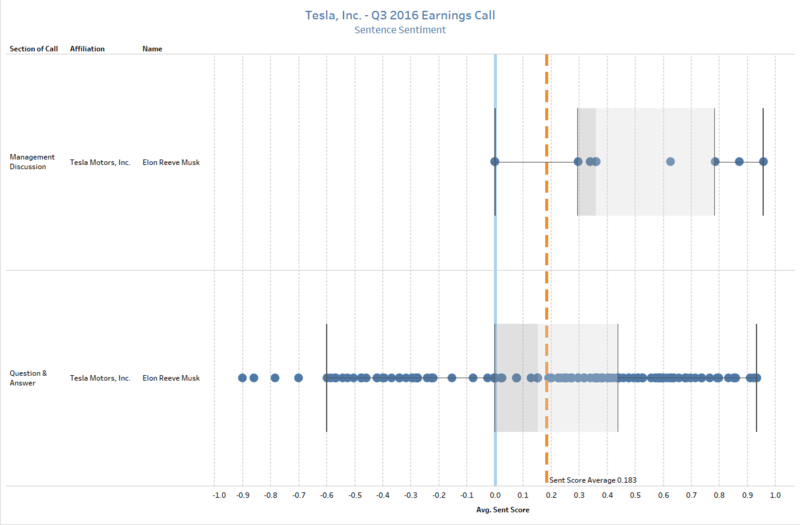 By leveraging FactSet Symbology (more specifically, the permanent individual identifiers), additional context to analyst comments can be added by joining to data from FactSet Estimates Detail database, which allows for a comparison of sentiment and the analyst’s recommendations on Tesla heading into the call. Following the same methodology as above, we plot out the sentence for each analyst. Red diamonds represent analysts with a sell rating, yellow triangles represent holds, and green checks are buys. The ability to blend unstructured and structured content seamlessly is crucial for a quantitative investor. By leveraging FactSet Symbology at the individual level, it facilitates the exploration of patterns and trends at a more granular level comparing Transcripts and Estimates. For example, are companies more likely to call on analysts with favorable ratings after or before a down quarter? Are analysts who participate on company earnings calls more accurate than their peers who do not? This example highlights how symbology at the individual level unlocks the ability to augment or enhance existing models. By employing an algorithm to do the work, these techniques can be applied across a full history of transcripts to see how language, participation, and affiliation can serve as leading indicators for future performance. Approaches like this can enhance existing factors or introduce efficiencies to the often-manual task of listening to earnings calls. If you have any questions or would like to learn more about any of the content mentioned above, please contact us at OFSupport@factset.com. Please visit the product page on the Open:FactSet Marketplace for more information: FactSet Document Distributor—XML Transcripts.